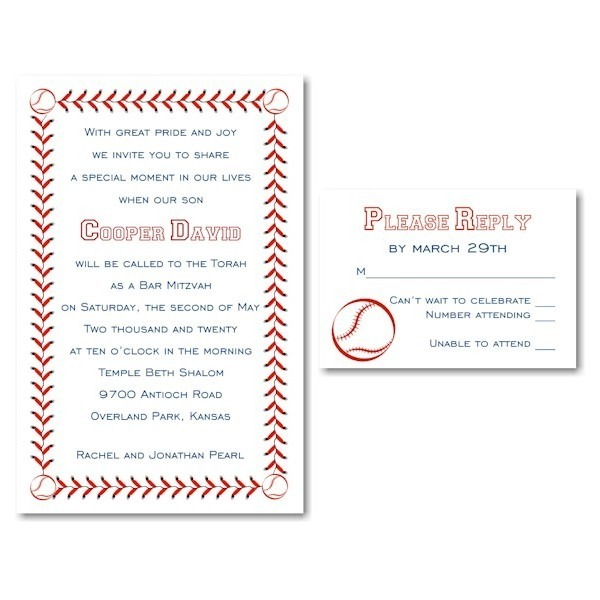 This baseball-inspired Bar Mitzvah invitation is digitally printed on #120 bright white matte card stock and features a border of baseball stitching to surround your wording details. Four small baseball motifs in each corner complete the look. 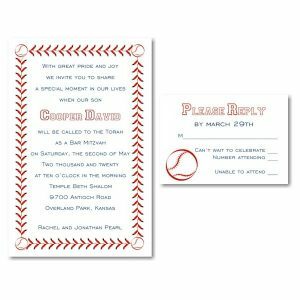 This baseball-inspired Bar Mitzvah invitation is digitally printed on #120 bright white matte card stock and features a border of baseball stitching to surround your wording details. Four small baseball motifs in each corner complete the look. Measures 5-1/2″ wide by 8-1/2″ high. Shown with Candy Apple Red and Navy Blue inks with lettering styles Engravers Gothic/Collegiate. The coordinating Reception and Response enclosures will print on matching bright white matte card stock and the Thank You notes will print on White Matte folder stock. Single White Matte envelopes accompany this Bar Mitzvah Invitation. Would you like to add a B"H caption to the upper right corner of your invitation for $14? Would you like to add Hebrew name to the invitation for an extra charge of $55? If so, please provide the child's Hebrew name in English and, if possible, spelling of name by indicating names of the Hebrew characters in the field below, clearly specifying order of placement. For example: Rachel - Lamed (far left), Chet (middle), Resh (far right).